Provides better readability of the code and helps you understand how the code structure is formed, especially in bigger projects. The Namespace Alias Qualifier in C# lets developers use the alias name instead of the complete namespace name. The advantage of the Namespace Alias Qualifier is that it lets you use the alias name instead of a bigger namespace ( like Inner Namespaces ) and it also helps to avoid the ambiguous definitions of the classes. 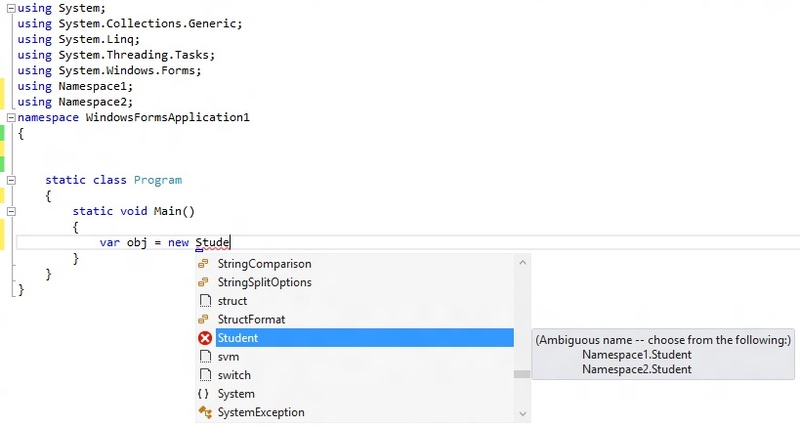 When both Namespace1 and Namespace2 are referenced in the C# file and are trying to create an instance of Student, it will cause the “Ambiguous name” error as shown in the screenshot below. To avoid this error, we could use the :: operator to provide an alias name for the namespace and use them accordingly.